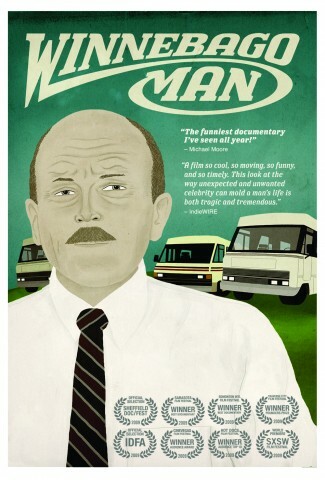 I loved Winnebago Man, and not just because I’ve shared filmmaker Ben Steinbauer’s utter fascination with the “swearing RV salesman” clip for years. I expected Winnebago Man to be funny as hell, and it is. But I was happily surprised to find that Steinbauer’s film is also one of the sweetest and most thoughtful documentaries I’ve seen in a long time. It’s a smart study of fame in the viral Internet video era, yes, but it’s also a moving presentation of friendship and emotional reawakening. Best of all, I think it represents not the culmination and summation of a life, but a new beginning for a man with plenty left to give. The “Winnebago Man” is Jack Rebney, the unwitting and unwilling star of one of the most revered “accidental comedy” clips of both the VHS tape trading and Internet viral video eras. As we learn in the film, Jack Rebney was once a CBS news producer who called New York home. However, by the late 1980s, Rebney had voluntarily left the frantic national media scene and had made his way, at least temporarily, to Iowa, in front of the cameras this time as a paid spokesperson in a promotional video for RV manufacturer Winnebago. During the humid, mid-summer outdoor shoot for Winnebago, Rebney struggled to remember his lines, couldn’t hit his marks, and swatted futilely at constantly swarming flies. In frustration Rebney vented, gesticulated, and self-flagellated, and his abundant curses sliced through the hot, wet Iowa air like so many turbine blades. His beleaguered crew kept the cameras rolling between the endless takes, and the video evidence of his (arguably harmless) harangues got Rebney fired from Winnebago. Nth-generation copies of the tapes were spread throughout the 1990s. Then, Youtube, Ebaum’s World, and a seat of (dis)honor on the first Found Footage Festival DVD—where I first saw the clip in 2006 or so—made true viral video legends out of Rebney and those “goddamn jackass” flies in the mid-2000s. Austin-based filmmaker Ben Steinbauer not only watched Rebney in the Winnebago clip obsessively for years, but he also felt tremendous curiosity about who Rebney was and what became of him after the infamous, grueling video shoot. Winnebago Man tells of Steinbauer’s quest, with the filmmaker himself as a central character, in three main acts—Steinbauer’s initial interest and pursuit, the first contact with Rebney and the subsequent complications, and the second interaction (a road trip to San Francisco). These two interviews with Steinbauer provide a fine synopsis of the film’s arc, which is wholly satisfying. However, what fascinated me and engaged my emotions as a viewer the most were a couple of the smaller elements of the film’s storytelling. First, Jack Rebney’s decades-spanning friendship with a man named Keith Gordon defies expectations, and the film’s gradual revelation of their unbreakable bond effectively punctures our first impression of Rebney as nothing but a cantankerous old coot. We learn that Rebney sheltered and helped a young Gordon during the latter’s troubled youth, and the affection that abides between the two many years later is glorious to behold. This aspect of the film becomes a testament to the redemptive power of the kind of friendship that approaches brotherhood or sisterhood. If you have such friendships, or if you once did but have seen one or more of them slip away, then I think you’ll find this piece compelling and moving. Second, through the film’s final scenes, post-film features and interviews with Jack Rebney, and the DVD’s featurette about Rebney’s trip to New York, I’ve come to believe that Winnebago Man’s most essential theme is the reclamation of a withdrawn man’s capacity for feeling connected to the world. In that sense, Winnebago Man is rare and special, in that it doesn’t just tell the story of a man — its making has become a turning point in a man’s larger life story. It’s reasonable to believe that, if not for Ben Steinbauer’s film, Jack Rebney would have spent the rest of his days in his mountain cabin, fuming over the state of the world, injured by his ridiculous “Angry Man” fame, and connecting only with Keith Gordon and perhaps other friends via telephone. That would have been not only Rebney’s loss but humanity’s as well. As we see clearly in the film and his subsequent appearances, the Jack Rebney of today is worthy of attention, affection, and warm regard, as he has remained an insightful, reflective, articulate, and generous man. When you rent or buy the DVD, I entreat you to watch the New York featurette, which shows what the film and the time since have done for Rebney. His positive energy, his regard for his fans, and the clear love and gratitude he feels toward Ben Steinbauer brought tears to my eyes. Seeing how far “the Winnebago Man” has come makes me optimistic that old age doesn’t necessarily have to mean a declining, gradually shrinking life. Jack Rebney has bloomed, not withered, in these years. Bless him, and bless Ben Steinbauer not only for telling us Rebney’s story up through 2007-09, but also for helping to shape the final redemptive chapters in 2011 and beyond. In the Winnebago Man clip’s famous words, Steinbauer has truly “done a kindness,” not just for Jack Rebney but for all who can now come to know the fine man behind the bizarre, hilarious legend.